Happy Almost New Year! I have been enjoying a few post-Christmas days at home to hang out with my family and to reorganize some spaces around the house. Today I am digging into my recipe files and gathering a list of appetizers to make for New Year's Eve. This recipe for Mini Cheese Ball Bites was on the top of my pile and it will be on the menu for sure! Our classroom culinary educators, Des and Sabine, made this recipe for two appetizer classes in December. I instantly fell in love with their recipe because it has tons of flexibility! The cheese and topping choices can be changed up to make this appetizer truly unique. Honestly, the sky is the limit in terms of experimenting. There are several ideas listed below but there are tons of other options worth trying. One of the most popular combinations in the classroom was the cranberry cheddar with a light topping of bacon. Double yum! 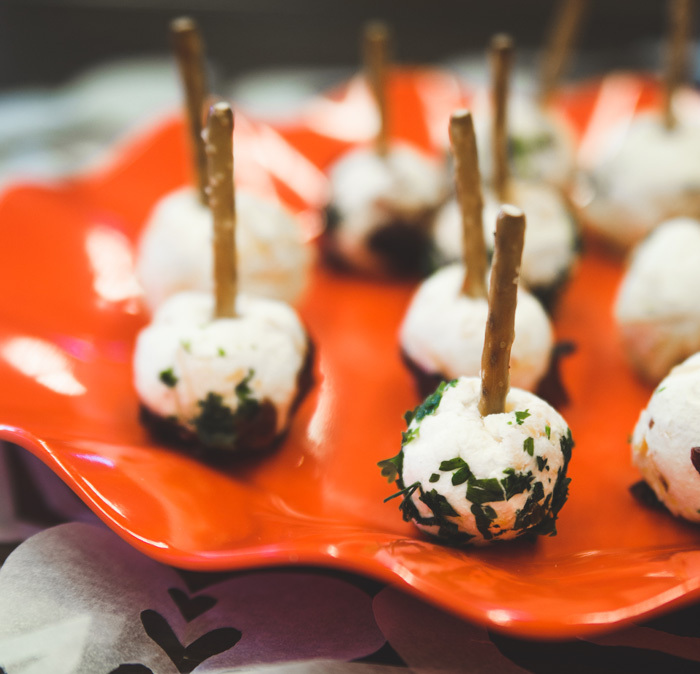 Give this appetizer recipe a try for your next festive gathering. Put your own spin on the ingredients to make it your personal combination of cheesy goodness. Eat well this holiday season and Happy New Year to yo! Mix cream cheese, goat cheese, shredded cheese and salt and pepper. With moistened hands, form cheese mixture into 1 inch balls. Chill 2 hours, then roll in topping. Add pretzel sticks before serving. Cheese Bites can be made a day in advance and stored in the refrigerator. Add pretzel just before serving.